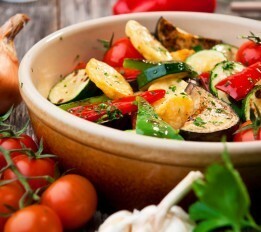 Combine the dressing, dressing mix, green onions, parsley and olives in the bottom of a large salad bowl and mix well. (You may need to use two bowls.) Add the broccoli, cauliflower, bell pepper, celery, zucchini and cucumber and mix well. Chill, covered, for 4 hours. Makes 20 servings.